It appears a new era of services for the homeless in Monterey County is just around the corner. Approximately $10.5 million in state HEAP (Homeless Emergency Aid Program) funds have been approved for Monterey County. Many meetings have taken place to get public feedback, to hear from homeless services providers and listen to city(s) and county government on partnerships that can be formed that will bring critical, sustainable services to our homeless population. Homelessness takes many forms, and a great deal of it is invisible. The most visible are folks with signs at the intersection of Soledad and Munras in Monterey, or sitting on benches in Old Town Salinas, or if you happen by an encampment near Jack’s Peak or in Chinatown. These are some of our most chronic homeless, people that need intensive case management. They’re often described as preferring a life of homelessness (so why should we invest resources in them?) but upon deeper examination, perhaps their “preferred” lifestyle is not being considered through a stable state of mind. Data shows that fully 75% of the chronically homeless have issues of mental health, substance abuse or are dual diagnosed. The 2017 Homeless Census and Survey counted 2,837 homeless in Monterey County. 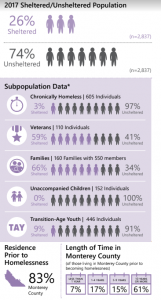 Of this, 605 (21%) fell into the classification of chronically homeless, and 97% of these were unsheltered. That’s why you see them. The 2017 count cited 160 families, totaling 550 individuals, as homeless. How does this happen? Think about the startling data on the number of people living paycheck-to-paycheck; losing just two or three paydays means falling behind on rent and perhaps not being able to catch up. Here’s another scary stat: 25% of Monterey County’s homeless have full-time employment. Homelessness doesn’t operate in its own vacuum. 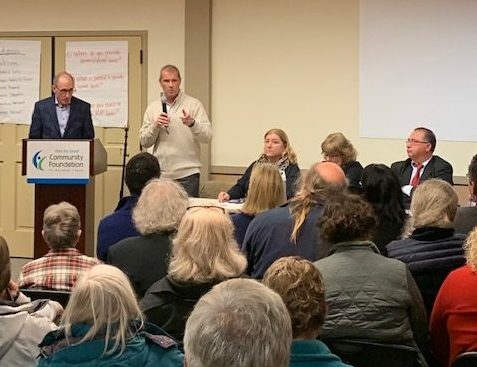 It is connected to the availability of affordable housing, healthcare, the willingness of landlords to accept Section 8 vouchers, and the coordinated efforts of many agencies. People moving out of homelessness need affordable housing. You may be asking, isn’t anyone doing something about this? Yes, lots of people, and there isn’t space to detail all the nonprofits, government agencies and people working on this critical issue. However, Monterey County has some built-in challenges. All of our unique cities and towns means multiple political jurisdictions, making it hard to coordinate programs and activities across city lines. The nonprofits that work with the homeless tend to be under resourced, and the donor community has a hard time knowing where their philanthropic investments will make the greatest impact. In 2012, Michael Reid, now a retired Episcopal priest, was moved by the stories of homeless women on the Monterey Peninsula. He came to me with a vision to start the Fund for Homeless Women. What he didn’t bring was any funding. Hearing his story and seeing his passion, the CFMC opened the fund. This year the grants from the fund pushed the cumulative grant total over $1 million. While Michael and his inner circle worked very hard, they also developed a focused, streamlined message that put the plight of homeless women and the programs that serve them in the spotlight. It was less about giving to specific agencies and more about targeted solutions. Donors responded. This brings us back to HEAP funding and how it’s changed the conversation. County supervisors are leading public meetings to discuss potential programs. City leaders from across the county are figuring out how they can assist each other. Salinas and Seaside are actively looking at developing permanent homeless shelters that will be operated in coordination with nonprofits and have the support of county government. 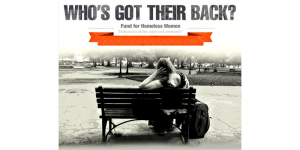 Nonprofits are teaming up to develop projects that target specific homeless populations. Vision. Alignment. Coordination. You can’t solve large-scale problems without them. Perhaps HEAP funds has willed us into a better way forward. 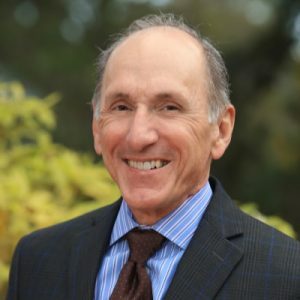 Dan Baldwin is President/CEO of the Community Foundation for Monterey County and sits on the Leadership Council for “Lead Me Home,” the 10-year plan to end homelessness in Monterey and San Benito Counties. View the Jan. 10, 2019 meeting about HEAP funding on YouTube.